Currently on view in the Hurlbut Gallery, Rick Hock’s 1980s Duchamp Codex is a 7-by-4 grid of photographic portraits. Most of the subjects are unknown, and even recognizable portraits, such as the Mona Lisa, appear manifestly mediated. To make these images, Hock filtered and transferred pictures from the negatives of peel-apart Polaroid film. White negative space indicates where the dye failed to take, giving the burnt red and brown display of images the appearance of Martian rock. Rick McKee Hock, a Rochester artist, curator, and educator who passed away earlier this year, was fascinated by the “curious reality of images.” This phrase, coined by Keith in a 1987 text, provides the title for the current exhibition of his work at the Visual Studies Workshop. In conjunction with the show, MAG, the George Eastman Museum, and the Rochester Contemporary Arts Center have all joined to celebrate Hock’s life and achievements. The three works at MAG are part of Hock’s series of Codices, in which the artist combined Polaroid transfers of images from books, magazines, posters, advertisements, how-to manuals, and other printed matter. The series’s title refers both to the format of such sources as collections of paper, as well as to the artist’s gridded compositions, with photographs laid out side by side like a book unbound. 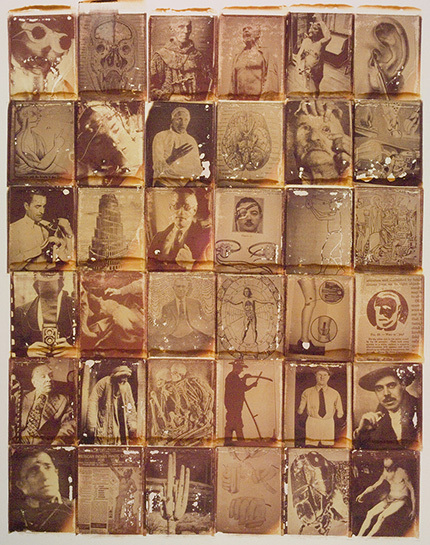 Though absent of written text, the images still betray the artist’s hand, or rather, his spoon: to make the transfers, Hock would interrupt the developing process of his peel-apart Polaroids and place each negative down on paper, rubbing it with a utensil to transfer the positive onto the surface. The practice of using pre-existing images, and particularly those of works of art, has a long art historical lineage that the artist’s Duchamp Codex clearly evidences. An image of a urinal–one of the few pictures not of a human body–depicts Marcel Duchamp’s 1917 Fountain, a so-called “readymade” sculpture the artist submitted to an open salon. In this context, the rough translation of the Mona Lisa could either be a reproduction of the painting or a reproduction of Duchamp’s “LHOOQ,” wherein the artist drew a mustache and a suggestive acronym on an already-reproduced postcard. In the lower left, a photo by Robert Mapplethorpe of Andy Warhol’s post-shooting scars references two other artists interested in the power of images. Within this lineage, Hock’s Codices offer us a look at the “inside” of photographs: the processes that make them, as well as the processes that make them work. The chemical magic of the Polaroid figures the way we make sense of images, combining what we know and what we see to create legible narratives of our own subjectivity. These works testify not only to Hock’s own fascination with images, but also his committed service to helping others construct their own senses of meaning. Posted: December 7th, 2015 under Exhibitions.